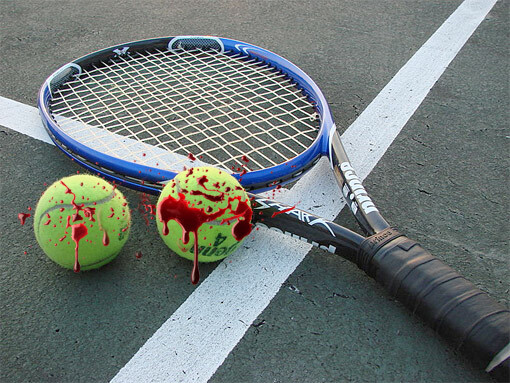 But what should the officials do when a tennis player, in a fit of anger, slams his own racket against his own head until blood starts pouring down his face? That’s what happened on Monday during play in the ATP Masters series in Florida when Russian netter Mikhail Youzhny became frustrated at his own unforced error and bashed the edge of his racket into his noggin three times. A large, steady stream of the crimson stuff rolled down from his hairline between his eyes and alongside his nose. The Russian looked like a boxer who needed Burgess Meredith from Stallone’s Rocky movies to come and take care of his cut. Play had to be stopped while Youzhny, the 11th-ranked player in the world, was checked by a trainer. No stitches were needed and the man with the dangerous forehand/forehead smash went on to win the match. It’s probably a good thing this didn’t happen during a doubles match.